Cryo Store’s Clinical trial logistics services take away all logistic worries from pharma companies, hospitals and medical institutes who participate in clinical trials. Clinical trials offer serious challenges in both cold chain management as actual logistics. Not to mention all administration and safety measures that are involved in the international exchange of bio products. Whether you need to send urine, blood or biopsy samples; under ambient, refrigerated or frozen conditions, we supply the right materials to ensure proper packaging and cooling agents to keep your samples in perfect condition during transport. We also provide the dry ice. Our dry ice provisioning service combines our expertise with world class courier services for a fraction of the costs of alternative premium suppliers. Cryo Store’s Clinical trial logistics services: our solution for your problem. You order the service through our online ordering system. 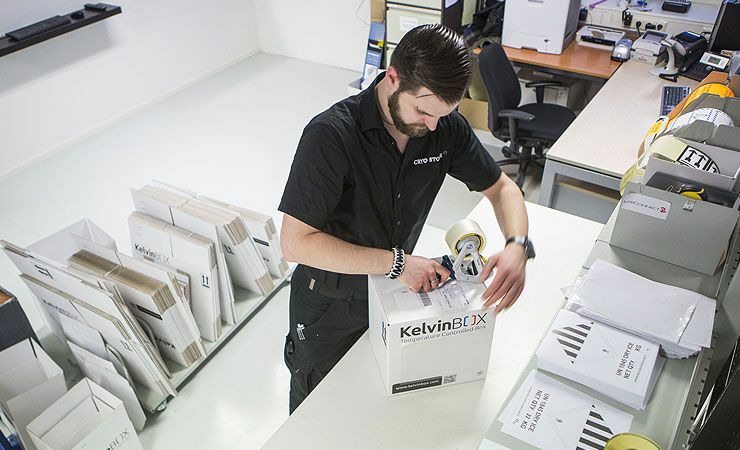 Based on your request, we assemble a packaging solution, supply it with all required (cooling and monitoring) materials, labels and documents, and address it to the final receiver This packaging is placed inside a second box, addressed to you.After receiving the box, you discard the outer box, add your clinical samples to the inner packaging solution. Close the box and when ready for dispatch, we will have the package picked up and delivered at the final receiver, safe, on time and temperature controlled. We can deliver dry ice anywhere in Europe. We also provide the possibility to combine shipments with different temperature requirements in one packaging solution, which makes our all-in-one solution a cost saver as well!